Tickets can be purchased online in advance of the fair and at the venue during fair opening hours Tuesday to Sunday, June 14-19, 2016. All tickets are valid for one day only. Students or Seniors with vaild ID. 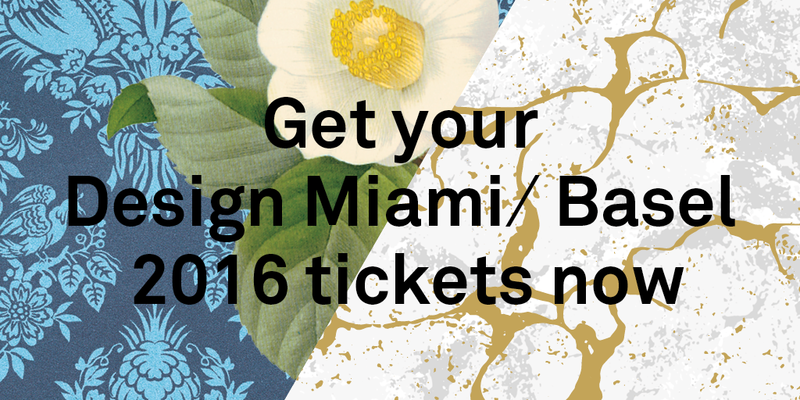 Access to Design Miami/ and Art Basel. When planning your visit to Design Miami/ Basel 2016, please note that there are new guidelines for bags, briefcases and other similar items: Any bags larger than 50 x 50cm (19.7 x 19.7inches) must be deposited at the bag check in Hall 5 (adjacent to Hall 1). Bags smaller than 50 x 50cm can be taken into the fair, but will be subject to inspection. Cameras, laptops and other such objects larger than 50 x 50cm will be allowed into the fair. Umbrellas, coats cameras and Design Miami/ Basel and Art Basel tote bags may be stored at Design Miami/ Basel’s coat check, which is located on the mezzanine level in the foyer. Any other bags or similar objects larger than 50 x 50cm must be deposited at the bag check in Hall 5.